I've talked before about worldbuilding and the challenges of just doing a copy-and-paste of Earth cultures, which, of course, you don't want to do. Draw inspiration from real-world cultures? Sure. But if you just drop them in, unconsidered, and say, "That, plus magic makes a fantasy culture", you're going to cause trouble for yourself. The biggest problem in doing something like that is when you do that, if you don't do the research work, then you could easily fall into the trap of making your fantasy culture merely the stereotype of the Earth culture you're inspired by. And then you'll fall face first into the Chakotay Problem. Chakotay, if you aren't aware, was the first officer on Star Trek Voyager, played by Robert Beltran, and his primary character trait was being Native American. What kind of Native American was relatively vague, though at least one episode narrowed it down to a tribe in the Amazon river basin of South America. Not that it mattered, because the show's presentation of him was "vaguely Native American", slapping any sort of poorly thought out trope or stereotype onto him. They did this with no regard to where in the Americas it came from, or even if it had legitimate origins at all. Part of this came from poor research. Apparently, the document prepared for the showrunners by an "expert" to draw from was written by a sham artist-- someone who claimed to be an expert on Native American culture, but had zero ties to it, no scholarship on the subject, and made things up whole cloth. So the end result was a mish-mash of stereotypes and Chakotay mentioning "his people" having sayings, stories or traditions, all of which were utterly made up. Tripe that was at best ignorant, and more often than not, highly offensive. Clearly, this is a thing you want to avoid in your worldbuilding. The best thing you can do is give your cultures dimensionality. Do the proper research. Make sure that the real-world cultures you are drawing inspiration from aren't immediately obvious. Build depth into them, and don't rely on trite stereotypes. Otherwise, all you'll do is highlight your writing as something not to take seriously. The Archduchy of Maradaine, in northwestern Druthal, lies between the Maradaine River and the Patyma river, with the Itasan Canal marking its eastern border. The Archduchy of Maradaine has three regions: the coastal lowlands called the Sharain, the rolling hill country of Toren, and the wide plains of Itasa. This archduchy might be considered the standard of Druthal from which the others deviate. The terrain consists of mostly wide, rolling plains of fertile land. The biggest use of the land is for sheep ranching, as well as farms, which are primarily devoted to wheat. Wool from these sheep are greatly valued commodities, as it is of the highest quality. The people of the archduchy of Maradaine are, for the most part, friendly, open and honest, and somewhat conservative in their concern for propriety. 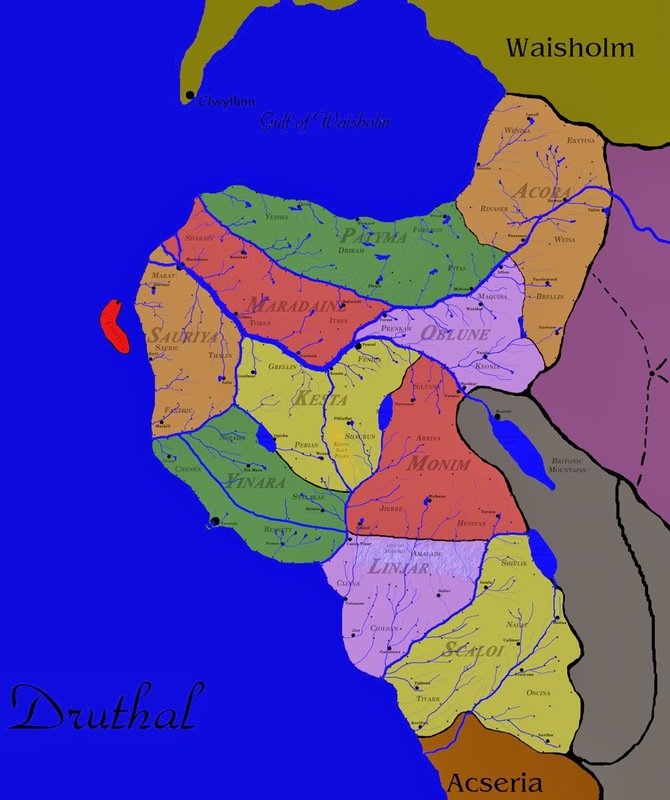 The city of Maradaine is officially in this archduchy, although the south half of would be in Sauriya. As it is the capital of Druthal, Maradaine is a city of tremendous activity, being the last major city on the Maradaine River before it reaches the ocean. The largest city in Sharain is Ressinar, which is also the official seat of power for the Archduke of Maradaine*. The primary industry of Sharain is sheep ranching, with Sharain wool being a valued good throughout Druthal and the rest of the world. Sharain is also known for its vineyards, one of the few regions in all of Druthal to produce quality vintages. Key foods in Sharain, besides lamb, are potatoes, onions and white beans, and wheat to a lesser degree. Duck is very popular as well, as they are plentiful in the region. The most common seasonings of the region are rosemary and mustard. A wide variety of mustard seeds are cultivated in Sharain, and many towns have their own special blends. Traditional dishes include Lamb Sharain, stewed with potatoes, seasoned with wine, onions, rosemary and mustard, or Lamb Sausages and Crisp-- potatoes and onions fried in duck fat. To the east, in Toren, there are less sheep ranches and more farms, growing wheat, barley and other grains. Ducks and other game birds are favored there, and bird hunting is a noted sport in the country around the city of Delikan. Toren wines are uncommon and unremarkable, but Toren beers are spectacular. In Toren, neither onions or potatoes are popular, though they can grow well in the region. Cabbages and mustards are the preferred secondary crops. Thus any Torenite dish will typically be stewed in cabbage and beer, with lamb-and-duck sausages being one of the most common choices. Further east in Itasa, the true "bread basket" region of the Archduchy. Here most of the wheat the supplies the city of Maradaine is grown. While Itasan breads are known to be hearty and yeasty, most of the rest of their cuisine is not noteworthy. Lamb stews with barley, or roasted birds with bread (chickens or ducks, mostly) are the common traditional dishes in Itasa. *- Archduke Kellen Hare, Eleventh Archduke of Maradaine. The Hares of Ressinar claim to be one of the oldest noble lines in Druthal.